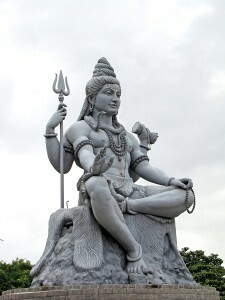 Every year tens of thousands of Lord Shiva Disciples or better known as Shivbhakts in India, visit the Amarnath caves, the famous shrine located in the “Heaven on Earth” state Jammu and Kashmir in the northern most part of India. Tough weather conditions, isolation from main land and even threatening from various terror outfits don’t stop the devotees to have a glimpse of their almighty’s lingam form made from natural snow. The cave is about 141 km from the state capital of Srinagar. This shrine is supposed to be one of the holiest shrines of Hindus and it specially attracts the SHAIV community. The lord is often seen as a yogi in deep meditation and he is famous for his ascetic life in the Himalayas. This is manifested from many of the idols and presentations in various forms including the literary works. The cave and the areas nearby are always covered in snow except during few weeks of summer season when the gates are opened for devotees. Although Government of India makes many efforts along with the state Government to keep the journey comfortable, many people volunteer and do the seva or serve the pilgrims at free or at very nominal cost. Please note that there are many fake travel agents who market via social networking sites and other means who claim to be OFFICIAL. It should be noted that the procedures are only done at the official organization Shri Amarnath Shrine Board AND Payments are done in JK Bank. One can also buy ration at fair prices from the specially established Govt. Depots at Chandanwari, Sheshnag and Panjtarni. Numerous tea-stalls and small restaurants can be of great relief. However, pilgrims are advised to carry with them biscuits, toffees, tinned food etc. to cater to their immediate needs. Firewood or gas can be obtained at Chandanwari, Sheshnag, Panjtarni and near the Cave. A Yatri duly registered by the Shri Amarnathji Shrine Board for the Yatra 2012, having a valid Yatra Permit issued by the SASB will be entitled to an insurance cover of Rs. One lac in case of death due to accident while undertaking the Yatra. Insulated huts and tents are installed during the Yatra at various Camps. These are available on rentals. Prepare for the Yatra by achieving Physical Fitness. It is advisable to start a preparatory Morning/ Evening walk, about 4-5 km per day, at-least a month prior to the Yatra. With a view to improving oxygen efficiency of the body, it may be useful to start deep breathing exercise and Yoga, particularly Pranayam. As the Yatra involves trekking at an altitude of 14,800 ft, do have yourself medically examined for the journey. An yatri needs to certify his medical competence to undertake the Yatra while applying for the Yatra Permit at the time of registration. For obtaining a Yatra Permit, a Yatri is required to furnish the prescribed Compulsory Health Certificate, issued by a Registered Medical Practitioner, along with filled-in Application Form. Embark on the Yatra only after obtaining a valid Yatra Permit after due registration as per the procedure prescribed by the SASB. You have to trek through high mountains, facing strong cold winds. Do carry woolen clothing, a small umbrella (which covers the head with elastic around forehead and supported by a strap around the chin), wind-cheater, raincoat, sleeping bag, waterproof shoes, torch, stick with proper hand grip, cap (preferably monkey cap), gloves, jacket, woolen socks and trousers. These are essential as the climate is unpredictable and changes abruptly from sunny weather to rain and snow. The temperature may sometimes abruptly fall to 5 degrees Celsius or lower. For Ladies, saree is not a suitable dress for the Yatra. Salwar kameez, pant-shirt or a track suit will be more comfortable for yatris. Keeping in view the tough nature of the trek, small children should not undertake the Yatra. Make sure that the ponywalla, the labouror, the dandiwalla is properly registered and carries an ID Card. You can get these allotted at rates fixed by the local administration, at the camps at Baltal, Nunwan (Pahalgam), Panjtarni etc. Keep the porters and horses/ ponies with your luggage alongside as it may be difficult to trace them in case you get separated from them. This is necessary as you may suddenly need something from your luggage. Carry sufficient money to pay for your accommodation at base camps and at other stations enroute to the Holy Cave and for meeting other personal requirements. To enable urgent necessary action in case of any emergency please keep in your pocket a note containing the name/address/mobile telephone number of any Yatri proceeding for Darshan on the same date as you are doing. Also carry your identity card/ driving license and your Yatra Permit issued by the SASB. Carry all the medicines which you take daily and, also some general medicines such as Glucose, Disprin, Combiflam, Move/Iodex, etc. Carry a water bottle, dry fruits, roasted baked grams/channa, toffees, sufficient chocolates, etc. for use during the journey. Keep some Cold Cream/ Vaseline/ Sun Screen with you to protect the skin from the cold winds/ sun. To have clear vision on sunny days keep dark glasses / goggles handy. While trekking, relax for a short while on steep inclines and don’t exert yourself beyond your normal capacity. The best way to perform the Yatra is to maintain a slow and steady pace. You will unnecessarily exhaust/tire yourself by walking fast. Provide all help to fellow Yatris, traveling with you and perform Yatra with a pious mind. Yatris are advised to strictly follow the instructions issued by the Yatra Administration from time to time. Earth, water, air, fire, and sky are integral parts of Lord Shiva. The Base Camps and the entire Yatra routes are the abode of Shri Amarnathji. You must, therefore, respect the environment and do nothing whatsoever to pollute it. Use of Plastic is strictly banned, and punishable under law. Use latrines / bathrooms in camps erected by Shri Amarnathji Shrine Board. Don’t defécate in the open. Cash offerings should be put in donation boxes of Shrine Board only. You may also prefer to donate through the official website. Don’t smoke and don’t carry/consume any kind of narcotic or alcoholic substance. Don’t use slippers because there are steep rises and falls on the route to the Holy Cave. Wear shoes with laces. Don’t attempt any short cuts on the route as doing so would be dangerous. Do not break traffic discipline or try to overtake others in difficult stretches of the route. Do not do anything during the entire Yatra which could cause pollution or disturb the environment of the Yatra area. Use of polythene is banned in the State and is punishable under law. 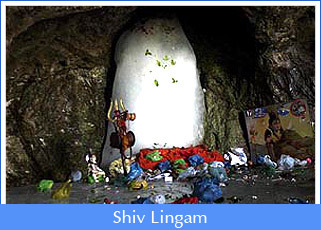 Do not touch or tamper with Holy Lingam and / or place or throw anything on the Holy Lingam. Do not use flash cameras inside Cave. Do not light incense sticks (agarbatties) or Dhoop inside cave. Do not pay more than the prices fixed for porters, ponies, dandies, rations, fire wood, accommodation etc. Do not pay more for Helicopter service than the rates displayed. Don’t stay overnight at Holy cave due to low oxygen. For more details and latest updates you may visit the official site.